Cubby Calories was drawn during a New Year's Eve church service in Brazil. Many of us were a bit bored because the service was long, and we wanted to be in a more familiar church, where we knew the people. Of course, I could understand little of the Portuguese, so I decided to start writing words. More specifically, I wrote down every Portuguese word I understood. As soon as I finished one word, I listened for the next comprehensible word to write down. The results of this activity mirrors one Jim Guys invented back in high school. We did the same in a class where we were encouraged to take notes from a lecture. We simply wrote as fast as we could, writing down each word that we heard in succession, which basically ended up being a list of random words. 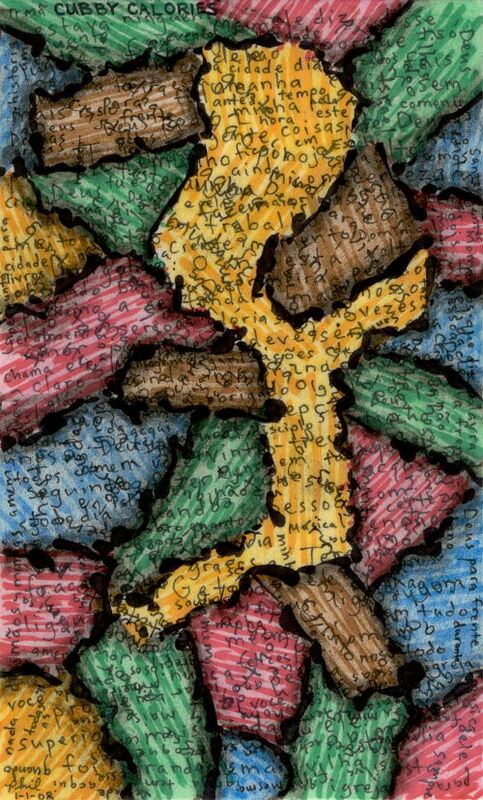 After returning from the service, I decided to make the words into a drawing and added strokes of many colors with both pen and colored pencil.